On March 18th, an Apple software engineer named Gray Powell went to a bar called Gourmet Haus Staudt in Redwood City, California. He was carrying a fourth generation iPhone with him, disguised in a case that made it look like a current-gen iPhone 3GS. Powell sent an update to his Facebook profile saying how much he liked the beer (unrelated, but funny: a Facebook fan page has sprung up around his story), and updated his Twitter a few times–he was out celebrating his birthday, it turns out. And then he left the Haus, accidentally leaving his iPhone behind. The phone was first picked up by another patron of the bar, and then handed off to an as-yet unnamed person who would end up selling it to Gizmodo. We’re taking Gizmodo’s word here that the iPhone prototype was not intentionally stolen from Powell, but picked up with innocent intentions. The new owner thought it was a regular iPhone 3GS. He turned it on long enough to figure out that it belonged to Powell, thanks to the update left on the phone’s Facebook app. By the next morning, the iPhone had been remotely disabled. Then about three weeks pass. It’s unclear why so much time elapsed before the news leaked. The iPhone’s new owner figured out that it was no normal iPhone 3GS shortly after it was bricked. Gizmodo claims that the new owner attempted to return the device to Apple, but no one from the company paid heed. In a followup, Gizmodo’s John Herrman explains why the phone was unable to make its way back to Apple–the new owner called Apple customer service, but due to Apple’s vaunted secrecy, the customer service agents knew nothing of the phone and assumed, reasonably enough, that it was a Chinese knockoff. It’s a once-in-a-lifetime story, after all; who would believe that a next-gen iPhone was found on the floor of a German bar in Redwood City? Apple itself was unable to track the phone down. The company remotely disabled the device the very night it was lost, which meant they could not call or text the phone to ask for it back. Even worse, Apple couldn’t track the phone using GPS, since the Find My iPhone feature just happens to not work in the current beta of iPhone OS 4.0. So this unnamed new owner was left with a next-gen iPhone prototype and no way to return it. What’s a guy in that position to do? He began shopping the device around for $10,000–this was according to Gizmodo’s arch-rival Engadget, who later redacted this bit of reporting from their original story for reasons that are still unexplained. Engadget’s original $10,000 claim is confirmed by this Dave Zatz blog post. York Times. (The best explanation of Gizmodo’s unique brand of checkbook journalism can be found in this Peter Kafka story from last October.) It’s possible Engadget dropped out of the race, although it’s also possible they paid for the photos that they ended up publishing. By the time Engadget published the first pictures of the iPhone 4 this past Saturday, April 17th, Gizmodo already had the device in hand. They’d had it for a few days by then. And, as far as I can tell, nobody at Engadget had actually seen or held the phone. The photos that ran on Engadget are so-so, certainly not up to top-tier tech blog standards. And Engadget’s story was filled with skepticism, even in the headline (“iPhone 4G: Is This It?”). After all, these blogs receive countless fake images, mockups, and rumors about Apple products. And Apple is known for running an air-tight operation and hunting down leaks with ferocity. It’s easier to doubt out loud than verify the leak. legit. And Engadget later revised their Saturday post to reflect a less skeptical outlook. Twitter, Facebook, and news outlets of all sorts ran wild with the story. 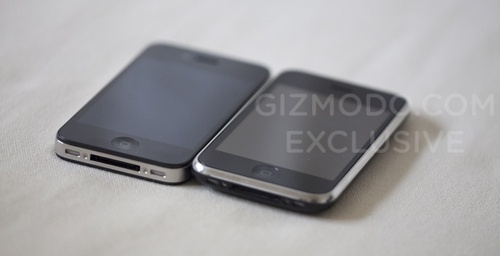 The focus was thrown back on Gizmodo: How did they get this new iPhone? Many voiced concern that Gizmodo was guilty of receiving stolen property. The story got the attention of Apple dictator Steve Jobs, who, according to The Awl, called up Gizmodo’s editorial director Brian Lam to chat about the leak. This was a moment of sweet revenge for Gizmodo. Just last month, Apple had delivered a last minute surprise to the gadget hounds there by withholding an early review version of the iPad that had been promised to them. While plenty of other mainstream reviewers and even lesser-known bloggers received early review units of the tablet computer, Gizmodo was left scrambling to cover the launch of the new product. Nick Denton promised a story of the leak would publish later that night, and that it would be a real “corker” (blimey!). That evening, Gizmodo did indeed post a story outing Gray Powell as the engineer who left the iPhone at the beer garden, showing a photo of him and linking to his Flickr page (the story didn’t mention the checkbook journalism). Many of Gizmodo’s commenters, and other tech writers, are outraged at the way Gizmodo treated Powell. After all, it was only last July when another young man in charge of fourth-generation iPhone prototypes for Apple’s Taiwanese manufacture Foxconn, lost one of the units. He later committed suicide. pathetic behaviour.” In response to the anger, Gizmodo editorial director Brian Lam posted a short note to Powell imploring him to “keep his head up”–not exactly the apology most were looking for. Later that same night, Gizmodo posted an official letter from an Apple Lawyer, requesting that the device be returned. That’s explicit confirmation that it is indeed an iPhone prototype, though of course nobody knows how similar it will be to the final version of the fourth generation phone which is expected to be introduced in June. In his response, Lam continued the amiable yet unapologetic tone toward Powell, saying “I hope you take it easy on the kid who lost it.” He also agreed to give back the phone–after all, Gizmodo had gotten more than they needed out of it. The phone was remotely disabled, anyway, so they couldn’t get past a “USB Connected” screen. That’s the story so far. We may in time find out who the seller was. But even if that person’s name does surface, it’s unclear that he did anything wrong. What is important is that within one day, a “Hitler video” riff on the situation debuted. The original Gizmodo post has been viewed millions of times over and is on its way to becoming the most popular story in Gizmodo’s history. And the debates over checkbook journalism, media ethics, and the competition between mainstream news outlets and Web upstarts will continue long after the iPhone 4 story is nothing but Wayback Machine lore. Update, April 26th: Gizmodo revealed today that on April 23rd, California police raided the home of Gizmodo editor Jason Chen (while he wasn’t even home, leading police to “bash in” his front door) and seized some of his equipment, including four computers and two servers. Gawker Media is claiming the search and seizure violated reporter privilege, and is demanding the return of the equipment. Read more about this development in our full story here. Or Choose Your Own Adventure through the saga.